Posted May 942, 2017 by McIvor Farrell & filed under News. The Police Service of Northern Ireland (PSNI) is failing to enforce civil injunction orders granted by the Northern Ireland courts, a Belfast-based solicitor has claimed. Solicitor Ciaran O’Hare of McIvor Farrell Solicitors is acting in a judicial review against the PSNI. 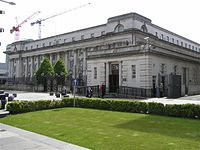 His client, Paul Baxter, claims police failed to make arrests in respect of reported breaches of a civil injunction order granted by a County Court judge under the Protection from Harassment (NI) Order 1997 to protect him from harassment from his neighbours. According to Mr O’Hare, the proceedings have revealed a lack of training for police officers in the meaning and purpose of these court orders and the protocol for dealing with them. On Friday, a barrister for the PSNI said it was accepted that police do not have any protocols, guidance or policy in respect of civil injunction orders, but that they will be implemented as soon as possible. Mr O’Hare said: “As a solicitor who deals with a high volume of Civil Injunction Order cases for protection from harassment, none of the defendants in any of the cases that I have dealt with have ever been arrested on foot of a reported breach of the order. “The failure to arrest has caused many of my clients upset and distress. In contrast, I understand that the PSNI make regular arrests on foot of reported breaches of non-molestation orders. He added: “The failure of the PSNI to appropriately deal with reported breaches of civil injunction orders for protection from harassment is twofold. “Firstly, police officers are not educated and/or trained on how to deal with reported breaches of these orders and secondly, no protocol exists within the PSNI for serving and keeping a log of these orders. The case has been listed again in September for review to ensure that protocols and guidance have been developed by the PSNI and have been merged into service instructions and into service procedure.